Check out drone and up-close footage of the expertly-restored royal “Golden Carriage” put to horses for a once-in-a-lifetime drive, released from a museum for this single event. The Armbruster Full State Chariot was owned at one point in its lifetime by Emperor Franz Joseph of Austria, driven for state events when it was important for the royal family to look its absolute best, most elegant and wealthy. Gloria Austin, a carriage driver and enthusiast, discovered the “Golden Carriage” in dilapidated state in a Hollywood film studio, years after the extensive royal collection had been broken up and sold. Austin poured money and time into expertly restoring the Golden Carriage, paying close attention to every last detail. 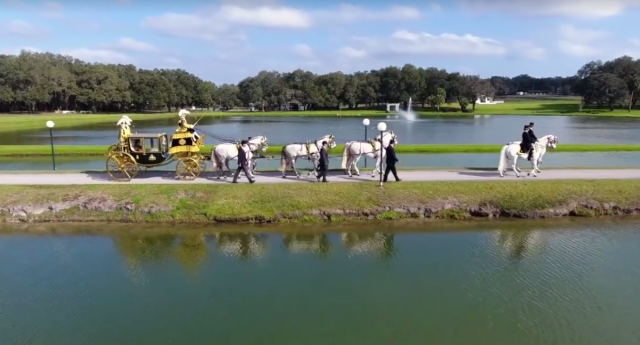 From authentic fabrics to real gold leaf applied all over the exterior, the Golden Carriage was returned to its original elaborate state and set up in the Florida Carriage Museum — but not before taking one last trip to Europe. 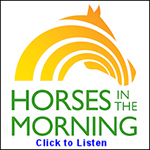 In February of this year, a rare opportunity arose for the Golden Carriage to be released from the museum for one final drive — put to six purebred Spanish horses selected by Austin specifically to draw this carriage, the Armbruster Full State Chariot rolled again, driven by a former coachman of England’s Prince Philip and assisted by many professionals. As for the passenger? The living descendant of Franz Joseph. Want to see the Golden Carriage in person? Visit the Florida Carriage Museum in Weirsdale, Florida.